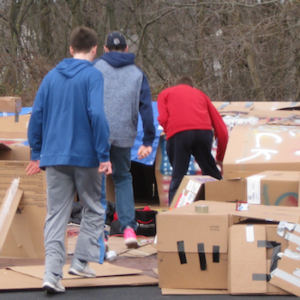 We are excited to join with St. James Limerick for their 10th Annual Box City Event from March 23rd – 24th, 2019. The purpose of this event is to raise awareness about homelessness in Montgomery County and to raise funds to Main St. Homeless Shelter in Pottstown. During the event, youth will hear real-life stories about homelessness, discuss and learn about this social issue in fun ways, and experience what it’s like sleeping without proper shelter. All youth must have a completed permission form signed by a parent or guardian. Box City 2019 Guardian Permission Form. Youth are also asked to collect monetary or in kind donations for Main St. Ministries. Box City 2019 Sponsor Form.